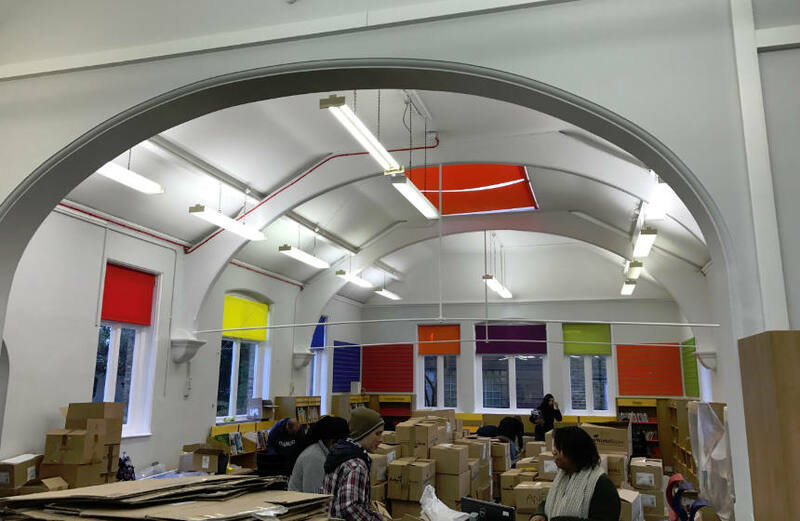 Undertaking a refurbishment of Nunhead library in South London as part of the work schedule they complete for Southwark council, Pride Developments invited us to assist with the fit out. We were invited to attend site for a brief, where we were advised roller blinds were the preferred choice of blinds, however following discussions, we suggested a more child safe blind would be more appropriate due to the fact this was the children’s section and access to the windows was restricted. We advised a gear-operated roller blind would be more suitable with a magnetic removable handle due to the use, and more important the access over the bookracks. With the product accepted and the colours selected this all seemed to be a simple project to produce 26 blinds in a multitude of colours for the children’s library windows and roof-lights. The bomb fell when asked what the site program schedule was and were advised we hand over on Thursday next week. (6 days away). Never to loose a challenge, the following Thursday we arrived with the new blinds, our aluminium tower and off we went to complete the install to one very happy client. Comments passed through the installation team were “you have got me out of a hole here lads” and we will surely use your company again on our next project.